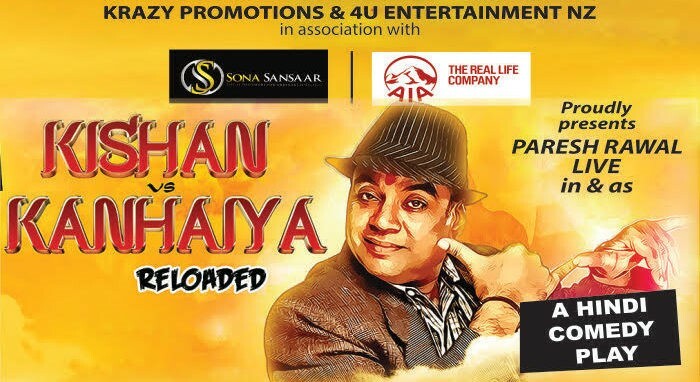 After the superhit success of Kishan Vs Kanhaiya, Krazy Promotions & 4U Entertainment NZ in association with Sona Sansaar and AIA Insurance are bringing “Kishan Vs Kanhaiya Reloaded”, the Hindi comedy play to Auckland. A show that you wouldn’t want to miss if you love a good comedy and of course, Paresh Rawal’s brilliant acting skills. The show will be held at Victory Convention Centre on 28 September 2018. Only limited VIP Tickets available. For the VIP tickets and more info., contact Prem on 021 376 999.